Meet Callie, the newest addition to the family. And I do mean new — fresh off the showroom floor, she’s as cherry as cherry gets. I can’t wait to take her on all manner of adventure, exploring every corner of the Philippines, high and low, taking countless photos along the way. Shame I’m not allowed to take her on the road for three months. After months of being limited to walking, public transit, and the occasional rented scooter, I was ready to buy a motorcycle. Freedom—sweet, sweet freedom—was at last within my grasp. I had spent weeks researching online and talking to countless local motorcyclists, to find the perfect bike for both my needs and my budget. 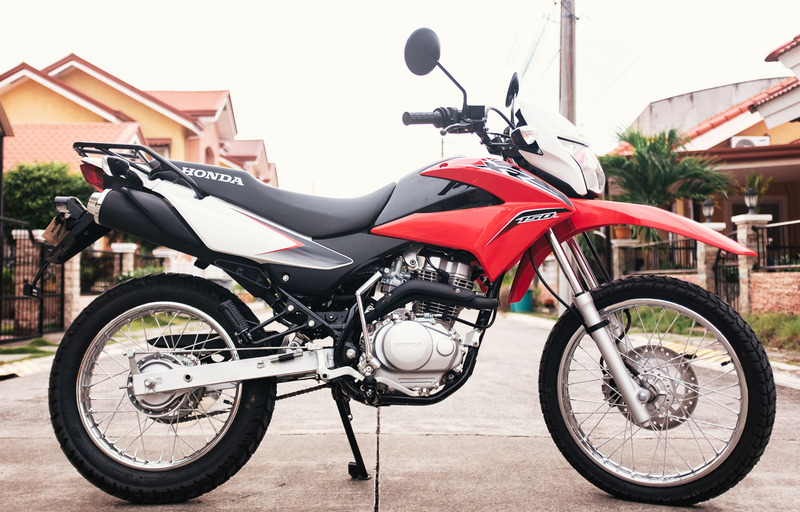 I settled on the Honda XR150, an enduro bike built for both dirt and asphalt, and perfect to handle whatever the Philippine roads could throw at it. Best of all, it was built for long-distance rides, and would be perfect for the countless road trips I intended to go on. I moved some money around and impatiently waited for it to clear. In the meantime I filled my head with plans of adventures both long and short. Day trips around Cebu; overnight camping trips in the mountains; weeklong sojourns exploring nearby islands; I was even planning a Cebu-to-Manila excursion at the end of the month. I couldn’t wait. At last, the money cleared. On a Sunday, of course, when getting to a bank would be impossible. But no matter, in just 24 hours it would all be mine. I felt like a kid on Christmas eve. I could hardly sleep. Tomorrow couldn’t come soon enough. But come it did, and I headed straight to the bank … where I proceeded to wait for two hours before a teller could see me to hand me my cash. Westerners: That is not a typo. The average wait at a Philippine bank branch is 2–3 hours; something to bear in mind the next time you’re annoyed at the slow line at your local Citibank. The two hours was torture. I walked around the mall. I ate lunch. Nothing made the time go faster. At one point I looked up other bank branches and, finding one not far away (which the security guard confirmed was a larger branch), I hurried down the road only to find it did not, in fact, exist. Tired, filthy from forty minutes of being engulfed in exhaust fumes as I walked on the roadside, I returned to the first bank and settled in for the wait, too exhausted to care anymore. Finally, a teller was able to see me and give me my own damn money. Cash in hand (well, buried in my bag), I went in search of a dealership. Everyone had advised buying from a dealer to be safe, suggesting I look first for a repossessed or self-surrendered bike for the best discount, but that a new one would be just as good, especially since I planned on reselling it in a year when I left the country. The first Honda dealership I visited didn’t have any repos but had a bike on the floor. They told me I could buy the bike today but I’d have to wait until tomorrow for some reason (something about paperwork; I wasn’t sure). No dice. I was through waiting. I wanted my bike now. I hit the road. Dealership number two didn’t have any in stock, new or repossessed. I kept walking. Dealership number three had them new (again, no repos) but wasn’t a Honda dealership and didn’t feel right. I walked some more. The fourth time proved to be the charm. Yet again no repossessed bikes, but they had it in stock at a better price than the others and, most importantly, I could take it home right away. Sold. I handed the cashier my money and stared lovingly at my new baby. She was even prettier in person. Oh you mean for the plates to arrive. Yeah, I know that. But I can ride around with a temporary, right? That won’t do at all. I need this now. Okay, let’s just cancel the transaction, then. There’s another Honda dealership I can check out. Yes but the money’s right there. Let’s just cancel. Apparently Philippine businesses operate under the strict commercial code of No Takesies Backsies. I should have fought. I should have argued and made a stink and demanded my money back. No one had told me that I’d have to wait three months to drive my brand new bike (curiously it never once came up in my research). I had already expressed to them that I wanted to ride it home today — it was obvious I meant to use the bike. In a way it was sold to me under false pretenses. I should’ve said something, but I didn’t. I just didn’t have it in me anymore. After three weeks of fighting with the cable and internet companies just to get basic services set up, after the ordeal at the bank, after walking from one dealership to another (by then my skin was two shades darker thanks to road pollution), after all of that, I just didn’t have any fight left in me. I sank back into the chair, dejected but silent. Guess the road trips would have to wait a few months longer. Seeing my crestfallen face, the associate offer to try and fast-track the application. If it went through I should have my papers in only two months. I wasn’t holding my breath. In the meantime, Kallie—whose name is short for Kalayaan, Tagalog for “Freedom”—will have to sit in the driveway, gathering dust instead of mud. I can’t even take her out just for neighborhood trips because there are traffic cops anywhere and all it would take is for one of them to stop me to discover I have no registration. Instead I’ll just stare at her longingly and continue to plan my road trips (now twelve weeks delayed), counting the days until November. Should have asked for a couple of sales invoices with dates a week apart. That’s how it is in the PH. At least you’ll get to use your bike immediately. I’d actually asked them about that and they said it wasn’t necessary. In retrospect I think they were just too lazy to bother. I’m happier having gone through the hassle, though. It’s reassuring to have it all taken care of and not just left hanging.